More than two hundred boutiques and galleries as well as several high end Department Stores carried my jewelry line during my career. The biggest selling item ever for me was earrings. I created hundreds of styles such as the ones pictured here with clip backs and lots of dangles. Color was a selling point as well as design. I created styles in denim, animal print, lime green, and every color combination one can think of. 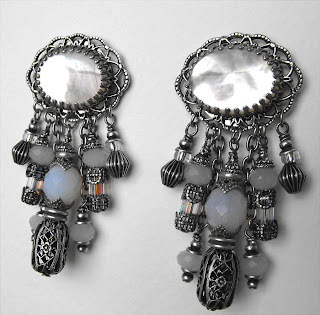 Customers still ask the boutiques for earrings in this style but they are very difficult to find now because designers create those little wire through the ear styles that look great on most younger women and not so great on most mature women. If you decide to create these earrings, here are a few tips to remember. Clip backs with cushions are a must. Create an interesting button top with a filigree or other looped finding as a base. Add an uneven number of dangles which graduate from longest in the center to shortest on the outside. (I've added as many as eleven rows of dangles on one earring. They sold to the first person who saw them.) Always use small jump rings to attach dangles so that the strand has motion and will hang straight. Adding chain as part of a few of the strands keeps the design from becoming too bulky. Use long beads as well as the flatter spacer beads, rondelles and bi-cones to have variety and interest in the design. Pops of color can come from large seed beads. Look at the color combinations in the stores you sell to. If there is a very popular jacket that combines silver and gray, make some earrings that would look great with that jacket. Now that I am in my mid fifties I understand perfectly why women my age look for button earrings with or without dangles. We like to hide those earlobes that may be stretched a bit. It's always nice to find a dangle pair of earrings to wear with simple necklines. It draws attention away from a neck that may not be as smooth as it was a few years ago. I was recently speaking with the owner of one of the boutiques that bought a lot of my work when I was still designing. The owner and staff told me that they have many customers who want this type of earring but they are rarely able to find them. The owner said she looks on Etsy for them! She sells the earrings in her shop for $75 and up. Don't miss out on a great customer because you don't have any of these earrings to offer. Make a few and see what happens. The feedback you get will tell you if you are on the right track. Always watch for the body language as well as what people actually say as they are looking at your work. When someone smiles and picks up a piece to study it, make a mental note. Even though they may not buy the piece it brought a positive reaction.